Drobeta-Turnu Severin is a harbor city of contrasts. I went there to understand its life in the post-industrial era, and see if it has cast away all its dreamers. On Google Maps, Drobeta-Turnu Severin seems to be drawn on a math grid, with streets that meet at straight angles, the resulting squares nestling shops, houses, apartment buildings, institutions, and companies. It seems to have been organized by a methodical mind that rigorously mapped out its arteries, waiting for the organism, implanted on the Danube’s bank, to grow and expand. For many of us, this city in western Oltenia is an abandoned territory, somewhere between geography schoolbook clichés and history. Here lie the foot of Apollodor of Damascus’ bridge, the Roman Castrum, and the ambitious hydroelectric power plant built in communist times, The Iron Gates I (Porțile de Fier I). I could see them all before my very eyes like cutouts in a pop-up book, proudly marching like straight A students. Then there’s the announcement broadcast at least once a day on the Village Voice Radio (Radio Antena Satelor). After a water bubbling jingle, at 12:10PM starts the hydrologic bulletin: Drencova – 800 cm, sinks 2 cm, Orșova – 225 cm, sinks 15 cm, Drobeta-Turnu Severin – 747 cm, rises 10 cm, and so on, down to the Sulina channel. This rigor of informing the public on the Danube’s water levels evokes uncanny, stale times. All these patterns made me curious to explore the space that elicits them, a space I found hard to integrate in the present. To that I added some current facts: a high unemployment rate, which for a while now has been keeping the county in the country’s top three; the news that the city will have no heating this winter; and research that defines it as a ‘shrinking city’. Because I grew up in a small city, I’ve always been interested in their fate. I wanted to find out if everything I knew about Severin indicates decline, or rebirth. So I went there. Before entering the Mehedinți county capital, the train leisurely crosses a deep valley coated in trees and purple musk thistle. We arrive 40 minutes late. I get off. The 35 degrees are overwhelming, and the train station, with its monumental columns and metallic sheen, makes me feel small. Inside, checkerboard floors and stainless steel handrails. I go out in the street to look for a taxi. Someone calls me. I get in the car – no logo or meter. The driver is in his 50s, has a sunburnt face and a benevolent vibe. “Have you heard of Elvis Prună (Romanian for ‘plum’)?” I ask him. “He wrote this song about Severin in the ’90s.” I’d stumbled upon the wailing manele song, described on YouTube as “gangsta”, when I started researching Severin. The first lyrics – How could I make a fortune / When I’m drinking beer all day / How could I build me a castle / When I’m wasting time in restaurants” – posed some decent questions, almost endearing. The taxi driver tells me he’s not much of a party guy, but he’ll ask his son, who “knows his stuff”. I find out that the guy who currently sings the song, Florin Mitroi, leaves Severin on weekends to play at weddings, so there’s no chance for me finding him. We fall silent, so I turn my eyes to the window. The road to the hotel goes up past Railway Park and Roses Park, stumbling here and there in gritty potholes. I can’t see much beyond the thick curtain of trees and bushes, but I know our companion on the left is the Danube. “The second longest river in Europe, after the Volga, and the only one flowing from west to the east”, I can hear my geography teacher saying. We reach the hotel in less than 10 minutes, and I hand him a 10 Lei bill. He tells me he has no change. That’s that, I let him keep it. The hotel, a communist relic, is a six-story building, long rather than tall. The façade is straightforward, giving away its structure. The rough exterior reminds me of Le Corbusier’s Radiant City: concrete – exposed, convincing, serene. A couple of flags wave at the entrance, propped up like candles on a cake, the bright colors lighting up the greys. I climb the stairs and enter a vast T-shaped space, with the restaurant and a pool table on its arms. In a corner, a white piano, a flowerpot, and a stand showcasing trophies won by local sports teams. At the front desk, five clocks indicate the time in Severin, New York, London, Rome and Toronto. I fling my backpack on a blue armchair with sculpted lion heads. When I ask for a room, I find out there’s no warm water except between 6 and 11AM and PM. I look in discontent. It’s the middle of the day, piping hot, and after the almost six hour train ride a shower represented the greatest prospect. “There’s no warm water since May”, the very nice lady at the front desk tells me. The Nuclear Activity State Enterprise, the city’s heating provider, is insolvent and doesn’t have funds for raw materials. Some solved the problem installing electric boilers. The others heat up their water in pots, on the stove. Anyway, a cold shower is just fine in this weather. Before going up to my room, I spot the hotel’s promotional banner, boasting in italics: Passion for perfection. The blue carpeted elevator takes me to the last floor. I open my room’s window, to look at the Danube. Tranquillity. And that soothing water hum. The river animates the border with Serbia, which for me now is just a span of green hills and red roofs. Severin’s reflection, the city across the river, is Kladovo, where you’ll find the other foot of Apollodor’s bridge. Romanians often go “to the other side” for pljeskavica, the Serbian hamburger served with a spicy sauce and onions, and cheap cigarettes. I glance at the Romanian harbor, snoozing toward shutdown. Before going to Turnu Severin I met Ilinca Păun Constantinescu, a 33 year-old architect with wavy hair and playful dresses, interested in contemporary urban phenomena and places on the brink of decay. This year she studied harbor cities on the Danube, for a paper called Shrinking Cities by the Watercourse: The Danube, Forbidden or Ignored Resource, all the data pointing to an early contraction phase. Along with Sulina, Corabia, Zimnicea, Turnu Măgurele etc., Drobeta-Turnu Severin can be defined as a shrinking city, with ever fewer functions, and people leaving for work elsewhere. I go out to get a feel of the city. On the left, at the Roses Park entrance, there’s a statue group between two towers. It’s the WWI Hero’s Monument, set in an undisturbed symmetry: four Doric columns, two gables, two bronze vultures, two rock lions, and a statue representing Victory, with a sward and laurel crown. In an honest symbiosis with the street, it seems to have lived its glory at the 1933 inauguration, and now is incapable of generating any emotions. I cross the Charles I Boulevard and take Ioan G. Bibescu Street toward city hall. Few people sitting in the shade, and a couple of kids jumping around an ice cream machine. I pass the Ada-Kaleh cafe, the only place reminding of the same-named island, flooded in 1970 by the hydroelectric power plant’s reservoir lake. The cafe has an oriental vibe with a touch of small town glam, but the current owner tells me it used to be a charming place, with regulars who enjoyed coffee and Turkish delights. Close by, the Severin and Strehaia Diocese, in an early 20th century building declared historical monument, one of the best kept I’ve ever seen. Saint Nicodim and a blue winged angel rest on the facade, sheltered by a slender niche. Next I pass by a closed dental practice and the Christian Democratic National Peasant’s Party, with a sign on the building saying: WE DEFEND YOUR ROMANIA. The blinds are shut so I can’t look inside, but in the window I notice a framed black and white news article with the headline: Not Everybody Accepted Communism. The Romanian Resistance Movement. As I look up, I’m happy to see a balcony with petunias, geraniums, and lush ivy, a miniature botanical garden. Finally, some life. “In my opinion, the person who designed the city created a stillborn, because it has no tension, everything is right-angled and boring,” an architect friend told me when we visited Severin together. The orderliness doesn’t leave much room for dreaming, yet every time you see one of the historical monuments – the theatre, the medieval citadel, the water tower, the bridge foot, the Roman ruins – the monotony brightens up. Or maybe it’s just that the past, simply because it’s long gone, becomes extraordinary. Dana is a chipper woman in her 50s, with glasses and a gentle look. Both she and her husband are geologists, and moved to Severin from Galați in 1998. They opened a bookshop because it’s what makes them happy, “but I might as well sell buttons and string.” The bestsellers are schoolbooks, followed by new releases. Regarding the age of her customers, she says between 18 and 30 “there’s a gap”, they’re not interested in reading. The young who stay here for college – in a small subsidiary of the Craiova University – stagnate. She knows of geography students who don’t have an atlas and don’t want one either, or others who study literature and don’t need George Călinescu’s History of Literature. “In general, people don’t know where the library is,” she says. “I have this saying: the young are leaving, so we’ll be left to turn off the lights.” I ask her about jobs in town, and she tells me the fight is for those in the public sector. “I think more than half are public servants. Businesses struggle.” As everywhere, many work abroad and send money home. Severin and its surroundings are beautiful, “especially for retired people”; Dana likes walking in parks and on Crișan Street. Before restoration, people used to call it Hunger Street, because there was no shop to buy a bottle of water, no tree to keep shade, no flower. Now it’s the most popular walking area. 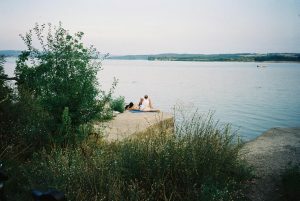 Before leaving her shop, Dana recommends a ride along the Danube gorge, starting with Gura Văii, Severin’s eastern suburb, until Moldova Nouă, a harbor town in Caraș-Severin county. The sceneries are straight from Game of Thrones, grand and otherworldly, with majestic cliffs wrapped in forests and a Danube that could swallow the universe. I know it from travel guides that describe the region, and take pride in Decebal’s Head, sculpted between 1994 and 2004, a monument “6 meters shorter than the Statue of Liberty and 8 meters higher than Christ the Redeemer in Rio de Janeiro.” The low-relief is 55 meters high, carved between villages Eșelnița and Dubova, and was commissioned by Iosif Constantin Drăgan, a businessman from Lugoj. He wanted to “pay homage to the last Dacian king” with a monument of “endurance, bravery, and pride”, as his namesake foundation’s web site explains. Under Decebal’s head, these words lie carved in stone: DECEBALUS REX DRAGAN FECIT (‘King Decebal, made by Dragan’). Close to the bookshop, two streets from the block that incorporated city hall and the county administration offices, is Decebal Shopping Center. I wonder about the people who shopped here 50 years ago; what did they dream of, how did they behave, would they relate to today’s city? I take the elevator to the 5th floor, the last. It’s almost entirely occupied by the Decebal restaurant, empty and quiet. Even the bar is vacant. A couple minutes pass until a waiter comes, and I ask him to open the terrace door so I can look at the city from above. The view has the beauty of remoteness, and moments are rich because you visually own everything: the streets that either go down to the Danube or run along it, the apartment buildings, the Lord’s Resurrection Cathedral, the Radu Negru Hall and the Water Tower, restored with almost 1 million Euros but still closed because it doesn’t have a fire safety permit. I return to the restaurant and head toward the exit, taking the elevator back down. After leaving the shopping center, I stop at the Radu Negru Hall, a historical monument built in 1907, and one of my favorite buildings in Severin. It has big windows and a red brick shell. I imagine it as a whimsical mix between the Bucharest Commodities Exchange and the São Bento train station in Porto. I picture it conquered by artists, and turned into a cultural hub with art galleries and studios, where the creatives’ cool urban language would organically grow. And in the small park next to it, electric outdoor concerts. In Berlin, it would’ve been trendy. I hope one day it will get even and claim its rights. Now the building is invaded by a big Chinese store, carrying a heavy plastic smell and stands selling shoes, clothes, carpets, bowls, toys. I continue my walk through Tudor Vladimirescu Park, and reach a small pond with a rotating stainless steel fountain in the middle – the Kinetic Fountain –, which enlivens the afternoon drowsiness. Then, a giant guarded by two griffins: the „Theodor Costescu” Theater. For six years it has been under restoration, but it remains closed because there’s no company to play. I take a left on Charles I Boulevard, and walk past a collage of houses with short arcades, thick columns, and decorative belt courses, until I reach the Mehedinți office of The National Archives. “Severin is a gift of the Danube,” the historian tells me. Set at the crossroads of the land and water routes that led to the north and south of the river, the terraced plain that later accommodated the modern city carries relics dating back to the Palaeolithic, over a million years ago. I go back to the times of hunting with hacked rocks, boats carved in tree trunks, and people taking shelter in shanties dug in the ground, on the riverbanks. I ask him about the archaeological site at Schela Cladovei, where they discovered 9.000 years old graves. He tells me it’s not in any way marked as a tourist attraction, although “it’s one of the oldest human settlements in Europe.” In Lepenski Vir, in Serbia, a similar site has been dug up and displayed under a glass structure. I’m thinking it could become a must-see. The Roman Castrum isn’t ready for visitors either. Only the foundation is left of the former military base, with the four gates, houses, and weaponry storage, and the commander’s building in the middle. The entire site, along with the Iron Gates Region Museum, the Roman baths, and the bridge’s foot have entered an extensive rehabilitation process in 2009, financed with EU funds, which should’ve been completed in 2013. In the meantime, there turned out to be additional operations necessary, which weren’t included in the initial budget, so the deadline has been extended to the end of 2015, in order to look for new funds. The site is in stand-by. I snuck in through a whole in the mesh fence, and saw the Roman rocks hibernating. Not a thing was moving. Just the wind and the impassive Danube. Modern Turnu Severin was born in 1833, four years after the Adrianopolis treaty (today Edirne, Turkey), which ended the 1822 war between the Russians and the Turks, and opened trade on the Danube. Thus, Wallachia, including the Severin region, was freed from Ottoman rule. Instead, the Russian occupation started, and was to end according to the treaty when the Turks would pay all war reparations. Since the Russians were interested in both stopping the Turkish expansion and that of the Austrians to the southeast of Europe, they focused on developing the cities by the Danube, and Severin had much to gain. “Turnu Severin was connected to the river, which is how it evolved,” says Rățoi. He speaks enthusiastically about the city’s birth, as if the whole history would play before his eyes. The Russian general Pavel Kiseleff together with Catalan architect Xavier Villacrosse designed Severin’s urban plan, “facing the Danube”, the streets either parallel or at a right angle with it. In the beginning, the population was mixed. Romanians from the nearby village Cerneți (burnt down by Turks during the war) expressed their wish to move, but refused to pay for land, waiting to receive it for free. Thus, the Wallachian Administrative Assembly decided to allow foreigners to buy land in the new city, immediately attracting Austrians, Germans, Hungarians, and Italians. Traders and craftsmen, Central Europe’s petite bourgeoisie, saw in Severin a great place for business, and wanted to take advantage of Danube’s becoming an important European artery. They brought western views and a capitalist mindset to a closed market, with feudal social relationships. The true economic growth of Severin started in 1851, when the Austrian shipping company built here the Navigation Agency and the Shipyard. German and Hungarian clerks, seamen, and craftsmen settled in the city, also supporting the opening of vocational schools. A year later, the Severin – Craiova road was inaugurated, which, together with the Danube, turned the city into western Oltenia’s Eldorado. A summary put together by Mihai Butnariu in The Drobeta-Turnu Severin Monograph shows that, in 1911, Severin had: “the shipyard, the Traian brewery, the concrete pipe factory, the ice factory, the candy factory, two brick factories, five soap factories, a large leather crafting facility, three locksmith workshops, three carriage workshops, and a foundry.” Population was more than 23,000. “The communist regime also did some good things, albeit sometimes chaotic,” says the Archive’s director. For instance, bringing peasants to the city to work in the big factories changed Severin’s appearance, giving it a mix-and-match feel. At that time the ancient name Drobeta was added, because it reminded of the Thraco-Getian origins, which communists wanted to underline, thus eliminating the “oppressive” Western influence. But locals never assimilated the name; whenever I happened to say “Drobeta”, I was quickly corrected: “Severin, we are Severiners”. The Party built a lot, with cheap materials, without regard of the city’s personality, attaching cookie-cutter bedroom neighbourhoods. This kind of apartment buildings were built all across Romania, becoming what specialty literature calls “ghetto-like areas with poor quality apartment buildings” or “former worker colonies”. Usually, the apartments barely meet minimum wellbeing standards; they crowd in small spaces the bathroom, kitchen and living room or bedroom. In Severin I found them at the outskirts, areas that the people living downtown consider to be destitute, shady, sometimes not even part of the city. Communism also meant grand national projects, and here one of the ample objectives was the Iron Gates I plant, built in partnership with Serbia, with almost 10.000 workers just on the Romanian side. A majestic plan that cost great sacrifices: around 100 lives were lost, and 10 settlements moved. “The construction started on September 7, 1964, and ended on May 16, 1972,” says the Iron Gates I Museum’s museographer, as the elevator takes us to the turbine room. We’re a group of about 20, some English speaking foreigners, some visitors from Orșova, and a Romanian family that emigrated. The lady is plump, with curly hair and glasses, the postal service clerk type. Standing next to her, I noticed her sly smiles, showing a gold tooth and subtle mocking of the group. “We’re going 20 meters down by the water, not under it,” she says. We quickly get to the visitor’s area, o sort of glass-enclosed balcony from which you see the six Kaplan turbines that provide 15% of Romania’s energy. The room is high, cold and formal. Nevertheless, it’s working. We feel the vibration in our feet, we hear the background whir. Actually, the white and yellow tip visible at the surface represents only a small part of the 195-megawatt turbine, weighing 680 tons. Each turbine is connected to a transformer installed outside, on the platform. The water flows in from the right side, from a 30-meter height, spins the turbines, generates electricity, and flows downstream, to the left. No matter how low the river’s discharge, it’s still enough for both the Serbs and us. “We’re sharing the Danube with the Serbs, not the energy,” the museographer says. We return to the exhibition hall at the entrance, showcasing pictures and childish descriptions in glass-topped cases, ancient pottery, and a remake of a Turkish house’s interior, with colorful carpets and a hookah. A “tribute” to Ada-Kaleh island, the home of a significant Turkish community before being swallowed by the plant’s reservoir lake. After the island with rose bushes and wild grape vines disappeared, most of its inhabitants either moved to Dobrogea, or emigrated to Turkey. In 1972, the Cellulose and Paper Mill opened in Severin, with five facilities: wrapping paper and corrugated cardboard production, wood preparation, chemical processing, and water treatment. After 1990, it was reorganized as a joint-stock company, and started making a profit. But the company’s financial position worsened once more, and in 2009 the employees have been laid off. Dana Borontiș, the head of the Severin branch of the Romanian Scouts Association, is a 30-year-old woman whose both parents worked at the mill since they were 16. She says that moment came as a shock. “It’s disturbing to pass by the mill that used to ring its siren three times a day, when shifts switched, at 07AM, 3 and 11PM, and see this hulk, which seemed immortal, empty and with a For Sale sign.” She was little back then, and although she found the city “pretty”, she never thought of coming back here. She wanted to live in a big city or another country, “to start from scratch”. But after college and some experience abroad she realized she could work for improving the lives of small communities, and came back. Between 1979 and 1987, the heavy water production plant ROMAG was built, mainly to supply the Cernavodă nuclear power plant. Between 1982 and 1985, the Halânga thermal power station was built, to provide the heavy water plant with technological steam, and also for the city’s heating. In 1988, the two facilities united as the Nuclear Activity State Enterprise (R.A.A.N. ), also with an investment plan for the power plant, to meet EU environment requirements. But it wasn’t. In 2013 the station became insolvent, and in June 2016 it officially declared bankruptcy. In November 2015 more than 1.500 employees were laid off, most of them specialized in their jobs and with no other qualifications. Brăila, unemployed ever since, says it’s such an “ill fortune”, because so many people lost their jobs, and the city was left without heating. They’re now investing in a new gas-fired power station, and, in case it’s not ready by October, the R.A.A.N judicial executor agreed to the Halânga power station providing the city with heating this winter. I take Dimitrie Bolintineanu Street toward the train station, passing Hazeltree Park. The shrinking city hypothesis I’ve discussed with Ilinca come to mind. She began her research with analyzing demographic data, the phenomenon’s fundamental indicator. For three years she has crisscrossed Romania, visiting almost 60 cities – focused on tourism, industry, agriculture, or with harbors on the Danube – in order to investigate how they survived the transition. She realized that most of them are going through various kinds of decline: socio-cultural, financial, physical, and demographic. Severin is a shrinking city. In 1992, at the first census after the Revolution, Severin registered its population peak – over 115.000. In 2011, the number sank to 90.000. That first census after Romania’s joining the EU showed that in 10 years the country’s population dropped by over 1.500.000 people, many leaving for work abroad. In a National Employment Agency report, published in June 2016, the Mehedinți county ranked third in the unemployment rate – 10,29%, after Vaslui (10,88%) and Teleorman (10,62%). It’s the beginning of the end – this is how Ilinca refers to the shrinking city phenomenon. First goes the economic drive, or whatever activity was keeping the city alive. The next phase is decline: fewer facilities, meaning not just the movie theatre, but public services as a whole. In the final phase, people simply abandon it. What would Severin need? I asked the Archive director, who admitted the city no longer represents an option for the young. “Anything that could attract investors,” he told me. On Timișoara Avenue, the western city’s exit, there’s a row of time forsaken industrial halls. Some look like endless glass greenhouses, some more robust, with concrete walls and missing windows. Many “For sale” signs. I remember the brown fields Ilinca was talking about, former industrial sites that are now out of use and could be repurposed. It wouldn’t only be cheaper than building a new facility – for instance for opening a supermarket –, but it would also change the city’s image. In the car we talk about the labor market. He knows he’s to run a city with draining energy. “Before the elections I did a door-to-door campaign, and ended up in a building with people living in only three out of 20 apartments,” he tells me. “The others left the country.” We exit the main road, take a right and ride along the Jidoștița river, which flows into the Danube. We reach two houses, isolated from the others, with the thick forest stretching behind. Families with very low income live here, and receive an aid from city hall. We barely get out of the car and people gather around him. A young woman with bleached hair and a baby in her arms, a grey man with sunken eyes, another one with a frown, a gap toothed woman dressed in red. They start complaining. They have no money, thieves attack them, they have needs. A fat man in slippers, an unbuttoned shirt, and cut marks on his body slowly comes closer. They shake hands, and talk about a possible building rehabilitation project, social aids, improvements. As we go into one of the buildings, a heavy, pungent smell hits me. The entrance is dirty, and hallways are dark. We’re invited in a dorm-like room, with scuffed linoleum floors and pink curtains. By the wall, a sofa where a small girl is sleeping, less than a year old; her mother picks her up, and shows her to us. She was born with a handicap. Pasted on the wall above the bed, a swarm of pink and blue hearts. We get out and walk to the end of the hallway. The same rooms and grime. As we leave, people keep following the mayor to the car. “Creating jobs is not one of my job’s requirements, I can only offer benefits for investors,” Screciu tells me. In his campaign he talked about building an industrial and logistic park with EU funds, benefiting companies in several ways: low concession fees, access to utilities, three transport ways (rail, road, and ship), a strategic location next to the border with Serbia. Regarding the labor market, the mayor also thinks it’s a mindset issue. It’s Florin Mitroi’s song, the one I asked the taxi driver about, “a badass party hit”, I hear some youngsters saying. I pay the 1 Lei ticket to the market, an endless array of whatnot: clothing, shoes, pots, decorations, blankets, CDs, paintings, refrigerators, car parts, skies, bicycles, sinks, and stainless steel buckets. Prices are lower than in regular stores, people mostly selling whatever they don’t need anymore to make an extra buck. In the “import” category you find cigarettes from the Serbs, tomato juice from Bulgaria, washing powder and cosmetics from Austria and Germany. It smells of donuts and fried fish. People bargain and zigzag from one vendor to another. “What do you have here?” I ask a collector in a red t-shirt and a cowboy hat. “Postcards, stamps, books,” he says, pointing to his plentiful stand. He’s wearing a Gemini pendant around his neck, for good luck. “They say you shouldn’t be superstitious. I wasn’t, but since I’m wearing it I got rid of all my troubles.” I ask him about sales, and he shrugs. He’s glad I’m taking his picture, and he’ll be on Facebook. A neighboring vendor joins us. “You didn’t want to take my picture!” I take their picture, arms around each other’s necks, behind chaotic stands. I buy three postcards of The Iron Gates, and he thanks me. “Wear your zodiac sign!” I hear as I leave. I pass a stand with colorful caps, with all kinds of writing: Mercy, Cocaine & Caviar, New York, Justin Bieber, Supreme, Armani Exchange. I also spot Turbo chewing gum, 30 cents apiece, plastic glasses, and a couple of books: The Schoolmistress with the Golden Eyes, Love Our Planet, and George Coșbuc poems. Yet, you mostly find heaps of second-hand shoes, and fields of white sneakers with neon writings. I’m just passing the time, not actually looking for anything. I barely navigate the overwhelming offer. My favorite remains the plush tiger in front of a loaded minivan, guarding two crates of nail polish (50 cents apiece). On the van’s roof, another tiger next to a bowing antelope. Both plush. I leave the market feeling tired and perplexed. Cătălin Boțilă is 33 years old, and one of the young people who chose to stay in Severin. He started rapping in the Schela neighbourhood (Romanian for ‘scaffolding’), in the western part of the city, when back in high school. He has bushy eyebrows, big eyes, and is easygoing. We talk on a bench in Dragalina Park, next to the theatre, close to the Danube. “I sang about poverty, I didn’t have any money, I was pissed”, he tells me. At some point he got a walkman and a B.U.G. Mafia tape, which he played on repeat for two hours. He got hooked, even though he didn’t initially like the lyrics because “they swore a lot”. We slow down in front of a bright red shop attached to a three-story apartment building, selling clothing, shoes, and food. We take a right, and explore the suburb. Apartment buildings are painted crimson, green, and grey, with a dry feel. They’re unkempt, with rusty tin chimneys popping out next to each apartment. “Since there’s no heating, each one has a stove,” he says. Those who could afford it had their apartments isolated, which explains the white styrofoam patches here and there. “Those on the ground floor, and gutsy enough, have built an extra room,” he tells me, pointing to such an extension on the sidewalk. Ion-Constantin Șolga also grew up in Schela, but in the area with houses. He left Severin after high school, and settled in Bucharest. He’s a tall 32-year-old, with sharp eyes and contagious energy. Growing up, he saw a lot of poverty. After the shipyard closed down, it became clear that leaving is his only chance. Both of his parents used to work there, and “once they lost their jobs, their whole lives crumbled. Then came the transition’s depression.” His mother now works in Italy, his sister in Spain, his brother in the UK, and his father only recently returned to the country because of health problems. He has worked in Serbia, Italy, Poland, Spain and Wales. In high school, Costi won the national history contest, and in Bucharest he went to Law School. We met in Bucharest, at the Movement for European Action and Initiative headquarters, an NGO he founded in 2012, dedicated to informal education programs meant to develop a different civic awareness. Some of these programs he implemented in Severin, where he feels that society is numb, and schools aren’t any help – he believes they teach anything but being a good citizen. During “the different week”, a nationwide school week dedicated to extracurricular activities, he spoke to kids about preserving the architecture in the Mehedinți Plateau Geopark, and held debate workshops. Kids learned to speak in public, build an argument, listen to the other. Moreover, they’ve started attending local council meetings, and plan to monitor them. This way, Costi believes, he’ll manage to teach them critical thinking and active participation. After the fire in the Bucharest Colectiv club, he organized a small protest in Severin, also with a couple of high school students. “Parents didn’t allow many to join”, he says. “They have this sort of fear, and they’re transferring it to the kids.” They all gathered in the Flag Square, showing solidarity to the victims’ families. They lit candles, and held banners saying “The day we give in is the day we die”, “Corruption kills”, and “We’re turning Severin into a city I want to live in”. A couple months later, he thought of running for city hall as an independent candidate, and joined The Youth Civic Action Platform (PACT). He campaigned for three weeks, returning to Severin and talking to people about “a 3D Romania – democratic, developed, and dignified.” He barely scored 1%, from a 36,45% voter turnout. He felt a bit disappointed, because he had hoped to ignite the wish for change. “I think Severin and maybe the entire country need an army of psychologists, because so many people have lost their sense of being,” Costi says. If he were to be elected mayor one day, he would install a video camera in his office, to regain people’s trust in public administration. He believes it’s only them who can trigger change; not by spending millions of Euros on renovating buildings, and projects “lacking form and substance”. We talk about the friendship with the Serbs and the trade across the Danube. “We behaved like assholes, pardon my French. The Serbs were dying, and we were selling them overpriced gas.” During the Bosnian War (1992 – 1995), a UN resolution imposed economic sanctions against Serbia, and Romania aligned to the embargo, and prohibited any trades with the Federal Socialist Republic of Yugoslavia (Serbia and Montenegro). But Romanians at the border were smuggling gas canisters across the Danube, selling it to the Serbs at higher prices. Dana is looking for emotionally gratifying jobs. After graduating Business School in Bucharest, she spent six months in a small village in Germany, volunteering for a youth club. There she realized how efficient working with a small community can be, so she decided to come back home. She got a job in marketing at the Continental Hotel, but she quit after a couple of months because it was poorly paid. She went again to Germany, as a high school teaching assistant in Wuppertal, where she enjoyed being in a bustling city. Concerts, exhibits, screenings, everything was great. She came back after six months though, because she missed her scouts, and found a job at a foundation in Timișoara. Before leaving I returned downtown, and went to the Cathedral to collect my thoughts. For a couple of days I had been a sponge-visitor, trying to process layers over layers of reality. Sometimes exciting, sometimes disheartening. Severin has got potential. I’ve heard this phrase so many times while being here, I’m afraid it’s reflex. I saw the present slipping away, or constantly postponed. The city doesn’t belong to history books – ancient relics can be worn as pendants on holidays –, neither to Party reports of industrial blossoming. Today it’s something a lot more trivial that will determine its fate: people’s average income. Ilinca – who refuses to translate ‘shrinking cities’ to Romanian, because she fears it would become the label for doomed cities – once told me that a moment of decline or abandonment can give birth to an avantgarde, to a new beginning. This opportunity could be planned out with the locals; urban scientists speak of dividing responsibility between public administration and citizens. But creating this new entity is not easy. It takes generations. “It’s a lifelong mission,” as urban architect Șerban Popescu-Criveanu writes in his paper Are Romanian cities really shrinking? Originally published in the September 2016 issue of DOR magazine.